If you’re interested in this career opportunity, send your CV here. The Digital Content Manager will be responsible for developing, executing on, and measuring the impact of a social media strategy, aligned with the broader strategic goals of our clients. Work with the brand strategy team to develop clear goals and objectives for each facet of the social media and web content strategy. Brief and supervise Creative Department / Third Parties for development of original digital content following preset tactical plans. 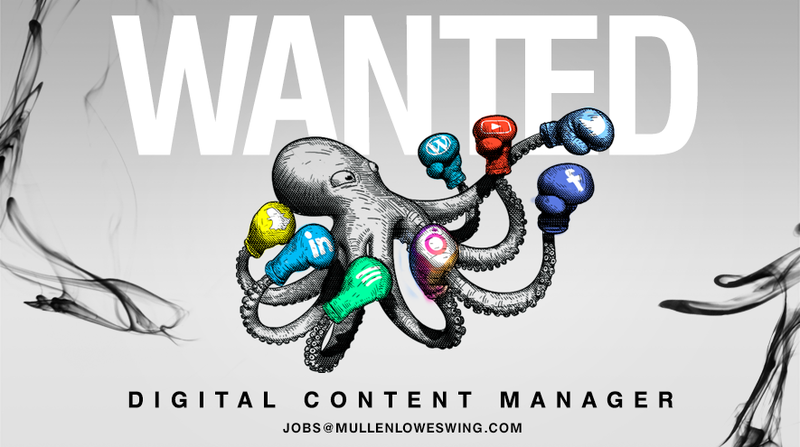 Oversee design of all types of digital content, i.e. Facebook Timeline cover and posts, profile pic, thumbnails, ads, landing pages, Twitter profile, promo pages, blog pages, You Tube pre-rolls, bumpers, etc. Manage social media channels on a day-to-day basis. Monitor, observe and respond in a timely manner to users in a “social” way while cultivating leads and conversions. Identify threats and opportunities in user generated content surrounding the business. Monitor competitive websites and social media channels. Report results from all types of digital campaigns on monthly and/or project basis. Prove 2-4 years’ experience in digital content development and social media marketing strategy and execution. Understand social media planning/posting tools. Learn website CMS (with provided training) to make site updates. Work with, analyze and report data received from all types of digital channels. Thrive in a dynamic and fast-paced environment; resourceful and creative in designing solutions and surmounting challenges. Be a team player, positive and easy to work with. Have strong writing skills is a plus. Last but not least – be fluent and literate in both Bulgarian and English languages.